At a crossroads between a cringe-worthy past (Todd the Toad) and an uncertain future (she's not exactly homeless, but it's close), Lucy Swift travels to Oxford to visit her grandmother. With Gran's undying love to count on and Cardinal Woolsey's, Gran's knitting shop, to keep her busy, Lucy can catch her breath and figure out what she's going to do. Except it turns out that Gran is the undying. Or at least, the undead. But there's a death certificate. And a will, leaving the knitting shop to Lucy. And a lot of people going in and out who never use the door — including Gran, who is just as loving as ever, and prone to knitting sweaters at warp speed, late at night. What exactly is going on? When Lucy discovers that Gran did not die peacefully in her sleep, but was murdered, she has to bring the killer to justice without tipping off the law that there's no body in the grave. Between a hot 800-year-old vampire and a dishy detective inspector, both of whom always seem to be there for her, Lucy finds her life getting more complicated than a triple cable cardigan. The only one who seems to know what's going on is her cat ... or is it ... her familiar? Cardinal Woolsey’s knitting shop has appeared on postcards celebrating the quaint views of Oxford, of which there are many. But when a visitor has tired of writing ‘wish you were here’ on the back of pictures of the various colleges, the dreaming spires, and the dome of the Radcliffe Camera, a cozy little shop painted blue, brimming with baskets of wool and hand-knit goods, can be so much more inviting. My grandmother Agnes Bartlett owned the knitting shop and I was on my way to visit after spending a very hot month at a dig site in Egypt visiting my archaeologist parents. Gran was always ready to wrap her warm arms around me and tell me everything was going to be all right. I needed comforting after discovering my boyfriend of two years Todd had stuck his salami in someone else’s sandwich. I referred to him now as my ex-boyfriend The Toad. I was thinking about Gran’s wisdom, her hugs and her home made gingersnaps, when I started to feel as though cold, wet fingers were walking down the back of my neck. My wheeled suitcase clanked and rattled behind me along the cobblestones of Harrington Street as I looked around, wondering what had caused the heebie-jeebies. The October day was chilly and crisp and, in the mid-afternoon, the street was busy with shoppers, tourists and students. Church bells chimed three o’clock. When I glanced ahead, I saw my beloved Gran. She wore a black skirt, sensible shoes and one of her hand-knit cardigans, this one in orange and blue. She was walking with a glamorous woman in her sixties whom I didn’t recognize. I thought Gran looked confused and my hackles immediately rose. The glamour puss was holding an umbrella over Gran’s head, even though the day was dry and there wasn’t a cloud in the sky. I waved and called, “Gran!” moving faster so my suitcase began to bounce. I was sure they saw me, but as I sped toward them, they veered down a side street. What on earth? I lifted my case and began to run; though my case was so heavy it was more of a grunting stagger. “Gran!” I yelled again. I stopped at the bottom of the road where I’d last seen them. There was no one there. A dry, shriveled leaf tumbled toward me and from a window ledge a small, black cat regarded me with what looked like pity. Otherwise, the street was empty. “Agnes Bartlett!” I yelled at the top of my lungs. I stood, panting. The side street was lined with a mixture of half-timbered cottages and Victorian row houses, all clearly residential. Gran hadn’t popped into a shop and would soon emerge. She was visiting in one of those homes, presumably. I wondered if it belonged to her friend. Well, there was no point standing there. I’d go to Cardinal Woolsey’s and wait for Gran there. Her assistant, Rosemary, would be running the shop and I could let myself into the upstairs flat and unpack while I waited for my grandmother to return. I retraced my steps, but when I reached the entrance to the quaint shop and tried the door, it didn’t open. I tried again, pushing harder, before my other senses kicked in and I realized that no lights were on inside. A printed sign hung on the windowed front door. It said, “Cardinal Woolsey’s is closed until further notice.” At the bottom was a phone number. Gran never closed the shop outside her regular closing days. And if she had, where was her assistant? I stood on the sidewalk that feeling came again, like cold fingers on the nape of my neck. Excerpt from The Vampire Knitting Club by Nancy Warren. Copyright © 2018 by Nancy Warren. Reproduced with permission from Nancy Warren. All rights reserved. Why would a woman who can’t knit craft a cozy series about knitting? It’s a fair question and one to which I can only answer: because I love a challenge. I came up with the title first. 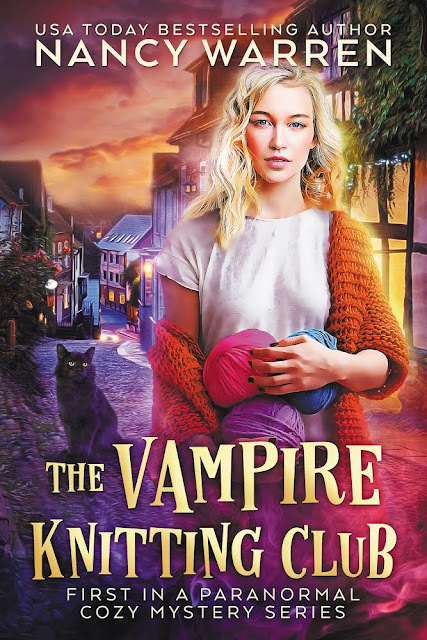 The Vampire Knitting Club was born when Pride and Prejudice and Zombies came out. I forbade anyone who loved me to buy me a copy because I was so incensed at what had been done to my favorite book. However, I began thinking about other ways subjects that don’t belong together could be combined. It was a silly exercise, the kind of thing you do when you can’t sleep, but then The Vampire Knitting Club popped into my head and wouldn’t leave. I loved the title. But I had no story. Then, one day, it came to me that this book was a cozy mystery. And, obviously, it had to be about knitting, probably set in a knitting shop. There was one tiny problem. I’m not a vampire, either, so I felt that I could maybe get away with the knitting thing. However, as I began writing the book, I realized I had to learn to knit. Lucky for me, I did. My heroine, Lucy, is from Boston but her beloved grandmother leaves her a knitting shop in Oxford. I was living in Oxford at the time and I really think it’s the most fascinating city as well as being quite mysterious. There are all kinds of medieval alleys, filled with shadows and history. A guy named Bill is famous for his ghost tours. Think about how many TV mysteries are set there. Things began to come together like wool and needles in the hands of a competent knitter. Which brings me back to not knowing how to knit. I made a trip back to Oxford and discovered two wonderful things. Oxford Yarn Store, which is owned by a woman named Karen who used to live in Canada, where I’m from. We got talking and it turns out we had lived in two of the same cities and knew some of the same people. It was incredible and exciting. I asked a lot of nosy questions, as writers do, and purchased some wool and needles, begging for something a beginner could do. Then I went to the knitting circle in her shop and imagined we weren’t a circle of happily knitting women, but a group of gossiping vampires. Best of all, whenever I got stuck in my knitting, which was often, someone would help. The second lucky break came when I discovered a group called Oxford Drunken Knitwits. I am not kidding. This is an actual group of knitters, in Oxford, who go to pubs and knit. It was fantastic fun. They’re all young, about a third of the group are men, and they sit drinking a beer or a gin and tonic and knitting the most amazing creations. Knitting became a lot more enjoyable when I could do it over a glass of wine in the company of the Drunken Knitwits. Come back on November 8 for my Review! 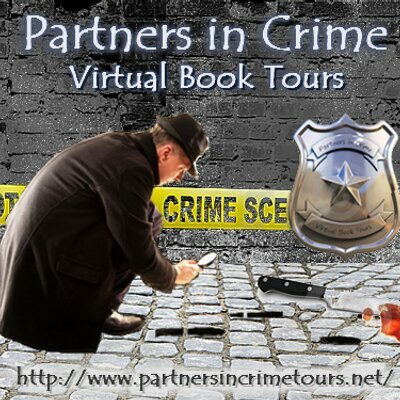 Nancy Warren is the USA Today bestselling author of more than sixty novels including the Toni Diamond cozy mystery series. 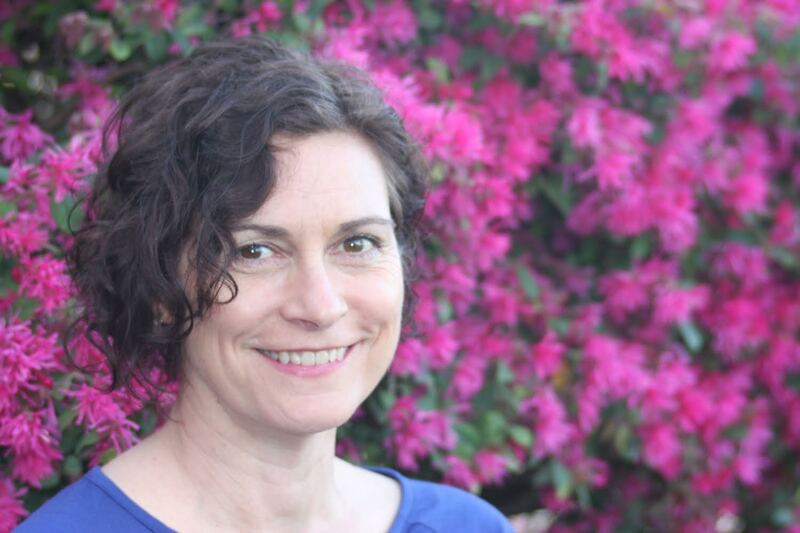 She shares her time between Victoria, British Columbia, and Bath in the UK. Nancy spills secrets in her newsletter and you can sign up on her website. Come visit her on Facebook, Twitter, Goodreads, and Amazon. Visit these other hosts on this tour for more reviews, interviews, guest posts, and giveaways!